Make delicious, traditional homemade pasta in as little as 20 minutes, with Great Aunt Gina’s Pasta Machine. Attach the machine to the edge of your table or counter using the clamp provided. Insert the handle into the right side of the machine. Before first use, remove excess oil with a clean, dry cloth. Pass a small piece of dough through all of the rollers a few times, then discard that dough. Attach the cutting rollers to the machine by sliding them into position along the interlocking guides and push down at an angle. 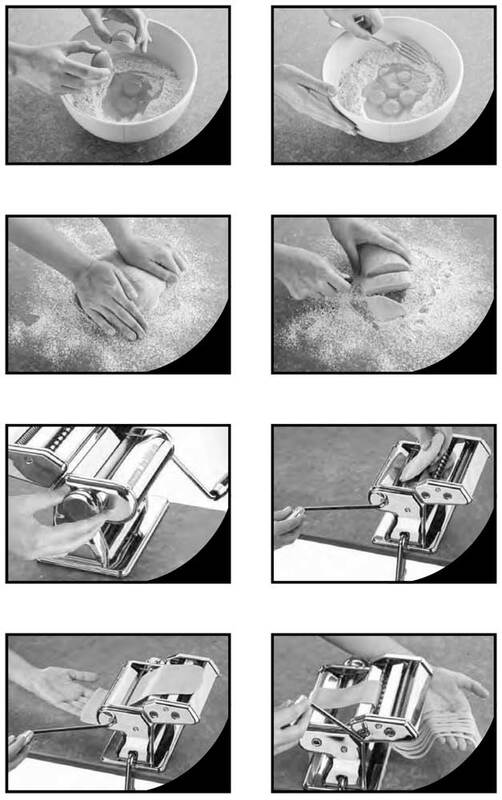 To remove the cutting rollers, simply reverse these steps. Follow Mamma Antonietta’s pasta recipe below. Set the regulator knob located on the left side of the machine (opposite the handle) to position number one. Pull the knob outward and turn it so that the two smooth rollers located in the front of the machine are completely open. Pass a slice of dough through the smooth rollers. Fold the slice of dough and sprinkle flour between the folds. If dough becomes moist, repeat this process several times lightly flouring the pasta sheet each time. Set the regulator knob to number two and pass the dough through again. Reduce the thickness of the dough by gradually adjusting the regulator knob decreasing it one number at a time until the dough is the desired thickness. When the process is completed, the next step is to cut the pasta. With a knife, cut dough sheet to a desired length and wrap the remaining sheet in a towel to keep from drying out. Remove the crank handle from the smooth roller position and insert into the opening of the desired cutting roller. Insert pasta dough sheet into the cutting rollers. Turn the handle slowly and hold the edge of the pasta so that it falls easily between the cutting rollers of the machine. After preparing your pasta, clean the machine with a dry cloth. Never wash the machine with water or place in the dishwasher. Do not insert knives between the rollers. 7. Use a sharp knife to cut off a chunk from the ball, flatten it a little by pressing it with the heal of your hand, set the rollers to the thickest setting then roll the dough through the pasta machine. 8. Sprinkle some flour in the middle of the flattened sheet, fold it double and roll it flat again. 9. Repeat about a half dozen times, until the sheet has taken shape. 10. The dough should be relatively soft, however anytime it seems too moist, sprinkle a little flour. 11. Finally, roll it to the desired thickness for cutting. 12. After cutting the pasta, sprinkle liberally with flour, to keep it from sticking in bunches until you get it into the pot of salted boiling water. Pasta strands can be hung from a drying rack, to keep from sticking until they’re ready for the pot, or to dry for freezing. 1. Cook the pasta in salted water for about 3 minutes, then drain. 2. Brown and season sausage and/or ground beef. 3. Using a ladle, spread a thin layer of sauce in a rectangular casserole, 9x13x2” or larger. 4. Place a layer of strips of pasta to cover the sauce. 5. Spread a thin layer of sauce on pasta. 6. Sprinkle mozzarella, grated cheeses and meat evenly over the sauce. 7. Place another layer of strips of pasta, in the opposite direction from the previous pasta layer. 8. Repeat the layering until they reach near the top of the pan. 9. Cover with aluminum foil and place in a hot oven for 30 minutes at 350°F. 1. Sauté garlic, onion and red pepper in olive oil. 2. Before they brown, strain them out. I use a skimmer. 4. Simmer for about 40 minutes. 5. After 15 minutes add salt and pepper to taste. 6. After another 30 minutes, check sauce for consistency; if too watery, leave lid off to reduce. 7. Stir often to avoid sticking, especially if the pot you’re using does not have a heat-diffusing base. 1. In a stockpot, 8 quarts or larger, add 1 cup of water, the diced vegetables, and seasonings minus the bullion, salt and pepper. 2. Cook until softened, and add more water as needed. 3. Add tomatoes and bullion. 5. When it comes to a boil remove the pot from the heat source. 6. Strain the cooked tomatoes through a food mill into a separate pot. 7. Once all is milled into this pot, put it on the heat of the stove. 9. Add partially cooked meatballs, sausage and braciole. 10. For additional flavor, add the oil used to fry the meatballs, sausage and braciole. 11. Simmer gently for about 2 hours. 12. Stir often to avoid sticking, especially if the pot you’re using does not have a heat-diffusing base. 13. Check for desired consistency, and remove the lid to reduce it for added thickness. 2. Using your hands or a meatball press, make balls about 1-1/2” to 2” round. 1. Brush olive oil on meat. 2. Sprinkle remaining ingredients on top. 3. Roll it and tie it with thin cotton twine. 4. Brown in oil and add to salsa. • Peel and thinly slice 5 lbs of sweet Spanish onions. • Lightly saute onions in 1/2 to 3/4 cup of extra virgin olive oil, until lightly colored. • Cover with oiled wax paper and steam on low heat until limp, about 15 minutes. • Remove cover, increase heat to medium, add chopped garlic to taste, at least 1/2 cup, and season with about 1/2 cup of chopped marjoram, thyme, parsley and a touch of allspice. • Add 1 cup wine, dry red or white, or vegetable stock if you prefer. • Simmer until stock is nearly absorbed. • Just prior to serving, toss with one head of broccoli, broken into florets and blanched. • Serve over cooked pasta. Bow tie pasta is a good choice, garnished with Parmesan and fresh parsley. • For four servings, you will need 3/4 lb of pasta, cooked in 4 qts of boiling water, with 1 tbs of olive oil. • While the water is boiling, use a heavy skillet to saute 1 to 1-1/2 tbs of garlic, either finely chopped or roasted in a generous 1/2 cup of extra virgin olive oil, just until the garlic turns golden. • For additional flavor, add a few chopped anchovy fillets, some chopped roasted peppers, some finely chopped plum tomatoes, or chopped fresh basil, either singly or in combination. Let your imagination and your tastebuds be your guide. • When the past has been added to the boiling water and cooked, drain and transfer to the skillet with the flavored oil. Toss with fresh grated Parmesan and black, rose’ or chili pepper and salt to taste. Garnish with fresh parsley. • For the best sauce, start with 4-5 cups of skinned and chopped fresh plum tomatoes. Stir in a medium pot with 1 cup vegetable stock, some fresh chopped basil, a touch of garlic, and a dash of allspice or cumin. • In a saucepan, saute 1 cup each of finely chopped onion, carrot, and celery, along with at least 4-6 cloves of finely chopped or roasted garlic, adding to them 1/2 cup of extra virgin olive oil over a period of 7-8 minutes in exactly this order, one by one. • Add the mixture to the tomatoes, simmer for 45 minutes, then salt and pepper to taste. • While the tomato sauce cooks, cut 1 lb of eggplant into 1/2-inch cubes, soak briefly in salted water, drain and add to the tomatoes. The object is to have it dissolve to add flavor and body. • Take one head of cauliflower, break into modest sized florets and add to the sauce 10 minutes before the ene of the 45 minute cooking period. • Take 4-6 medium green zucchini, halve lengthwise, slice thinly, and soak in salted water. Drain and add to the sauce just as it is finished. • Cook 5 minutes longer and serve over cooked pasta. • For days when quick is the operative word, remember that a reasonable quantity of pasta can be cooked ahead of time, kept in the refrigerator for 3 or 4 days, coated very lightly with olive oil, and stored in plastic containers. It can be re-heated by dipping in hot water or in a microwave. • Frozen stir-fry vegetables and a store-bought Italian dressing or olive oil vinaigrette can be combined with cold pasta and heated in a microwave for 5-1/2 to 6 minutes. • For a quick cold pasta salad, combine fresh or defrosted vegetables with your favorite ranch or peppered Parmesan dressing, add to your chilled pasta, serve on some red leaf lettuce, and there you are. Never wash Keep all pasta makers away from water to keep steel parts and wires from rusting. Brush and scrape Wipe off flour with a pastry brush. Use a plastic scraper to remove any sticking dough. Lubricate Lubricate from time to time, depending on the humidity in your environment. Place a drop of mineral oil where each roller meets the body. Store Store in the original box, in a dry place.